Ray Betzner read his first Vincent Starrett book when he was 15, and has continued his admiration for Starrett for 45 years. He is a member of the BSI ("The Agony Column") and other scions, and works as Associate Vice President for Communications at Temple University. Betzner edited the 70th anniversary edition of The Private Life of Sherlock Holmes, and runs the website "Studies in Starrett". Peter Blau welcomed him back to the Red Circle after a 23 year hiatus. Betzner characterized his tale as a childhood fascination which became an adult obsession, but it is, above all, a story of friendship built around a mutual admiration of Sherlock Holmes. Charles Vincent Emerson Starrett was born on October 26, 1886 in Toronto, Canada. His grandfather owned a bookshop there, and young Vincent lived upstairs with his parents and siblings. After moving to Chicago when he was young, Starrett developed an interest in Sherlock Holmes and book collecting, which would become the touchstones of his life. He worked for several Chicago newspapers, and by 1917, Starrett owned the premier collection of Holmes-related books in the U.S. He was one of the first to be intrigued with "the literature of Sherlock Holmes," and faithfully collected it. Starrett wrote The Adventure of the Unique ‘Hamlet’ in 1920. (With only110 copies or so printed, it is indeed a collector’s item, and the current asking price for a copy is about $6,000.) Starrett continued to collect books through the 1920s and 30s. In 1933 he wrote The Private Life of Sherlock Holmes, which combined criticism, analysis, and a bibliography, and was a book ahead of its time. He had some financial success with this book, but unfortunately it was first published during the height of the Great Depression; for the average person at this time, books were an unnecessary luxury. This publication did bring him to the attention of Christopher Morley, who invited Starrett to the first BSI dinner. Although Starrett never attended another BSI dinner, he and Morley continued their close friendship until Morley’s death in 1957. He also became friends with Edgar W. Smith, who both complimented and critiqued Starrett’s book. After the outbreak of World War II, Starrett wrote "221B," his sonnet to Sherlock Holmes, and dedicated it to Edgar Smith. 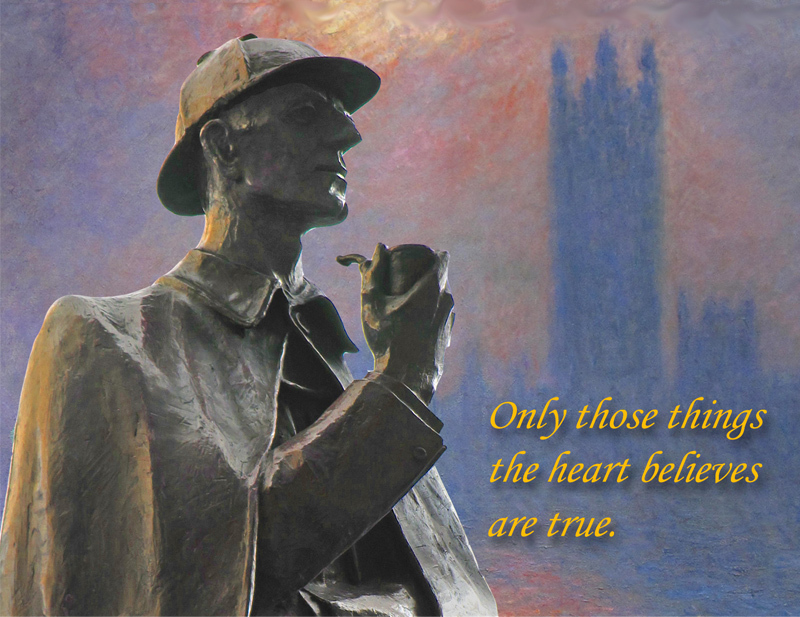 Betzner describes the poem as "immortal words that are a profession of faith for the Sherlock Holmes community." Unfortunately, Starrett often teetered on the edge of financial ruin. At one point he had to sell his Holmes collection; when another enthusiast heard about it, he sent his small collection to Starrett, saying that Starrett should own it, for he would appreciate it more. This unexpected generosity was an impetus for him to start collecting again. Starrett died on January 5, 1974, at age 87. At that point he was close to penury, and his gravesite had the most minimal of markers. In 1986, his friends set up a collection to buy a headstone. The final monument is of an open book displaying Starrett’s two bookplates: that of his personal library, as well as the one for his Holmes collection. He was esteemed in death, as he had been in life. Editor's note: A full transcript of Ray's talk is available on his blog here.